Heartworm infection takes place when a mosquito carrying infective, microscopic-size heartworm larvae, bites into your pet for a blood meal. The larvae then actively migrate into the new host and develop further as they travel through the subcutaneous tissue in your dog or cat’s body. At about 3-4 months, they settle into the arteries and blood vessels of the lungs, where they continue to develop to sexual mature male and female worms (Dirofilaria immitis). Heartworms are the most serious common parasite for dogs because they stress the dog’s heart by restricting blood flow and can damage other internal organs. The heart may enlarge and become weakened due to an increased workload, and congestive heart failure may occur. Left untreated, the disease can be fatal to dogs and cats. Parasitic heartworm infection is a life threatening infection that can be prevented by a simple monthly treatment. Living in the tropics we deal with mosquitoes year-round. 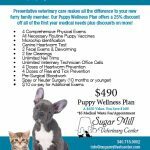 The best way to prevent heartworm and heartworm related illness is to provide your dogs and cats with monthly heartworm preventative available at Sugar Mill Vet Center. While cats are more resistant to heartworms than dogs, they are still susceptible and we do see feline heartworm cases here on St Croix. As with dogs, a cat is infected when a mosquito carrying the microscopic larvae of the heartworm bites the cat for a blood meal. The worms develop in the cat’s subcutaneous tissue as they migrate towards the blood vessels of the lungs. After about 3-4 months, they settle into the arteries and blood vessels of the lungs where they continue to develop into sexually mature male and female heartworms. On average the time from bite to mature heartworms is 8 months in cats (about one month longer than in dogs). Our parasite preventative of choice for puppies, kittens and cats is Revolution. It covers not only fleas, ticks, ear mites and intestinal worms, but just as important … heartworms! If your cat hasn’t been tested for heartworms, we recommend testing prior to preventative treatment. We love this for cats and kittens because it covers heartworms for cats. Cats can get heartworms too!